This review is long overdue, due to my phone going whappy and losing all my photos – including those I took at the Wick at Both Ends’ new menu launch. Thankfully my phone is now back up and running, so I can (finally) share my thoughts on the Wick’s new spring/summer menu! The new menu has the same rustic, gastro pub feel of previous Wick menus, although there does seem to be more meat and fish this time around. The Wick at Both Ends haven’t completely forgotten about vegetarians, though – there are a couple of veggie-friendly mains inbetween all the ox tail and kidney pies, sausage and mash, and butter roasted plaice. There’s also a selection of meat-free sandwiches, plus the Wick’s trusty flat field mushroom and goat’s cheese burger, which has been my favourite thing to order there for years. If the Wick ever get rid of their mushroom burger, I’ll be very sad. 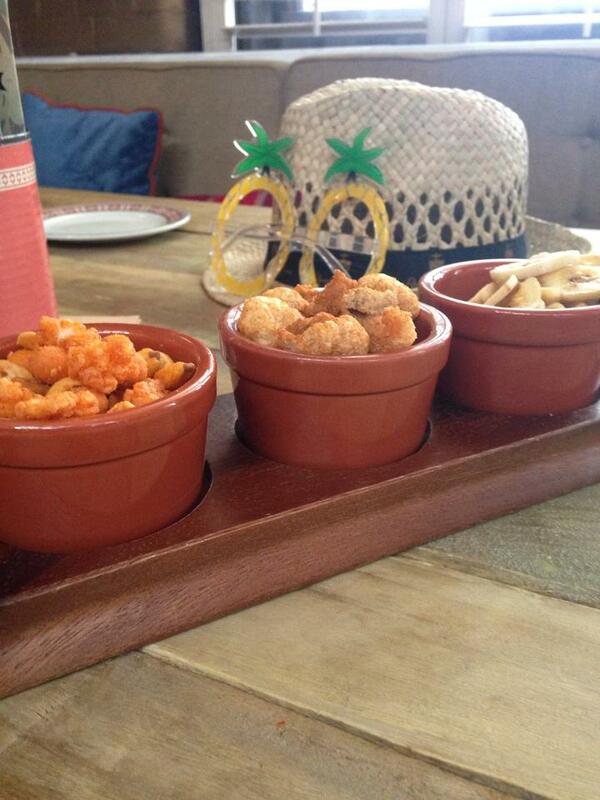 One thing I’ve noticed about the Wick’s menus, is that the starters tend to be more adventurous than the mains. The spring/summer menu is no exception, featuring unusual starters such as pan fried calves liver, pickled mackerel, and pistachio and prune terrine. One starter that really caught my eye was the warm potted crab (£5.50). 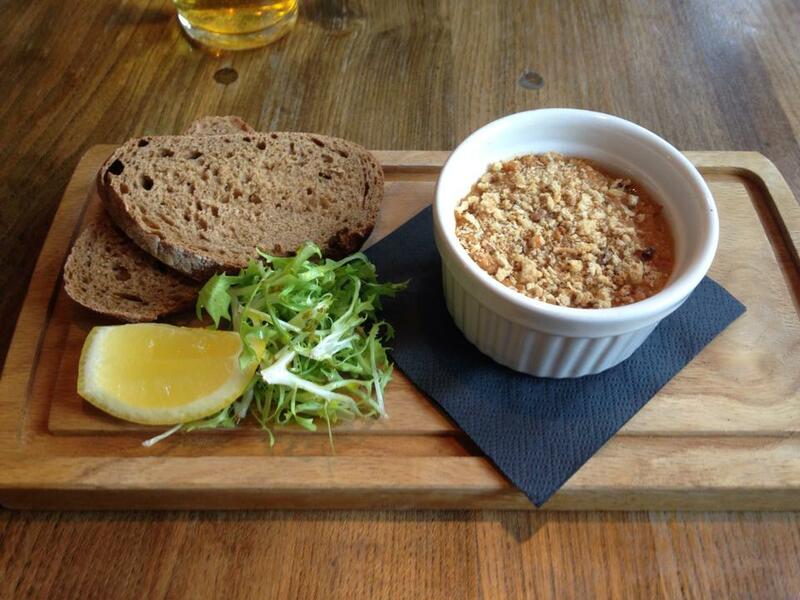 I love potted shrimp but I’ve never tried potted crab before, so I knew I had to give this a go. This is a big starter! My ramekin was jam-packed with lots of fresh and tasty crab meat that had a lovely, velvety texture. If you’re not a fan of strong seafood then you should probably give this one a miss, as the crab is seriously strong. My only issue with the potted crab is that it’s just so filling! After I’d used the accompanying slices of bread and butter to scrape up every last morsel of delicious crab, I was left wondering how I was going to find room for my main course. This is such a generous portion that I think the potted crab would work really well as a stand alone snack – possibly after one too many Wick cocktails have given you a case of the beer munchies! For a seafood fanatic like myself, this potted crab starter felt like the ultimate treat. In fact, I have a few seafood-loving friends who I’m going to drag to the Wick at the earliest opportunity, because I know they’ll love this starter every bit as much as I did. For my main course, I continued the fish and seafood theme with some Smoked Haddock Kedgeree (£8.95). This wasn’t just the first time I’d had kedgeree at the Wick, it was the first time I’d had kedgeree ever, so I was really looking forward to trying something completely new. The Wick’s vibrant yellow kedgeree is certainly nice to look at. I’d found the potted crab a bit heavy going, but this kedgeree was even richer. This is another massive portion, and the rice is really rich and creamy. Like the potted crab, this is food strictly for those who enjoy strong, fishy flavours. Even though I was getting uncomfortably full, I just couldn’t stop eating this. 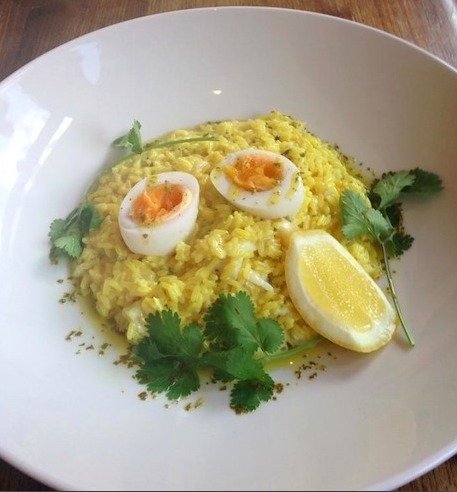 The Wick’s kedgeree really is too good to waste. Meanwhile, my friend had opted for the 8oz Onglet Steak (£11.50), which was another new addition to the Wick’s menu. After some Googling it became clear that onglet steak is the same as hanger steak, which they’ve also just started serving at the Wick’s sister venue, Anchorage (if you’re interested, Anchorage’s hanger steak is amazing and you can read about it here). 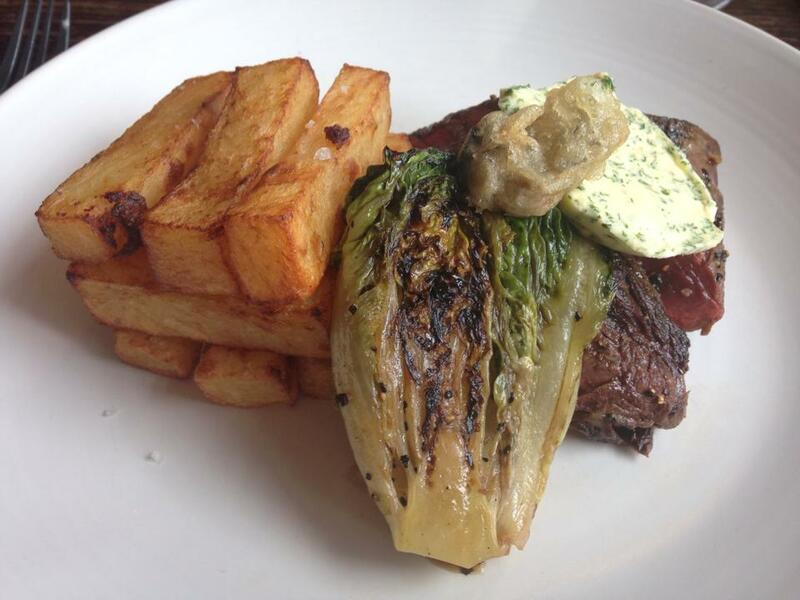 The Wick’s onglet steak has a really intense, rich flavour. If you like your steak, then you need to try this onglet/hanger cut, as it’s stronger and tastier than your average steak. The onglet steak came with a stack of chubby, perfectly-seasoned chips, a super-sized serving of parsley butter, and a token bit of greenery in the form of some grilled baby gem lettuce. These are all pretty standard sides when you order a steak, but then the Wick throw a curveball by adding a single battered oyster to the plate. The oyster was nicely cooked and had a really intense flavour (this seems to be a theme with the Wick’s new menu!) but there’s no getting around the fact that this is more batter than oyster. 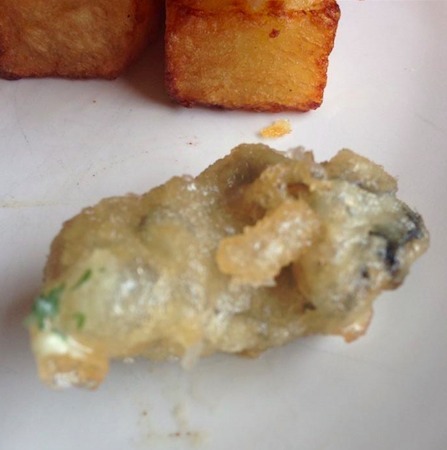 Now, I know that for £11.50 you can’t expect such a fantastic steak, fat chips and a pile of oysters, and yes oysters are always going to look smaller with the shell removed – but this single battered oyster did look a bit odd on its own. Despite mixed feelings about the battered oyster, the onglet steak was well received, and for the price you do get a big plateful of grub and a superb cut of meat. The Wick’s latest menu continues the tradition of big portions of quality food at reasonable prices, with a few quirky ingredients thrown into the mix. The starters are on the pricier side, but my potted crab starter was worth every penny. The Wick is one of my favourite places to grab a bite to eat in the city centre, and judging by how much I loved their kedgeree and potted crab starter, this isn’t about to change anytime soon. 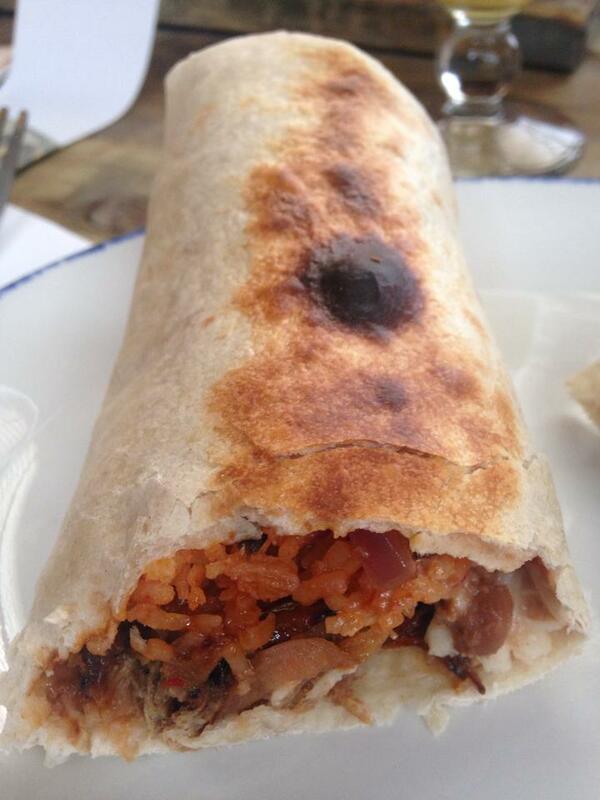 If you haven’t already, you can check out the Wick’s new menu online. Let me start by saying that I’d no intention of writing about the Wick at Both Ends again (or at least not until their next menu change) but sometimes, a meal is just so good, you can’t resist raving about it. So, following a too-good-not-to-shout-about meal at the Wick with some friends this week, I’m spreading some more Wick at Both Ends love. After branching out and trying something new on my previous visit, this time I couldn’t resist ordering my old favourite, the Wick’s mushroom burger (£7.95). I wasn’t alone, as two of my friends couldn’t resist the burger menu either, and opted for a pair of beef burgers (£7.95 each). Whether you’re a beef or a mushroom fan, burger lovers can mix things up with a range of additional toppings, all priced at an extra 95p each. 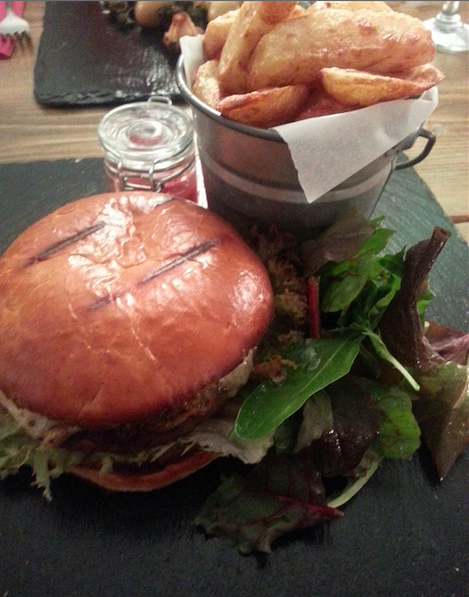 All of the Wick’s burgers come with homemade relish and some seriously chunky chips. First to arrive at our table, was a double act of beef burgers. 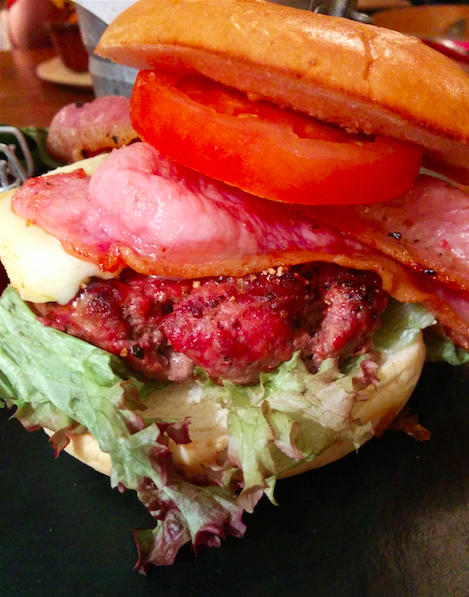 My first burger-loving friend opted for an extra topping of two rashers of bacon (a snip at 95p) and creamy farmhouse brie (again, 95p more). 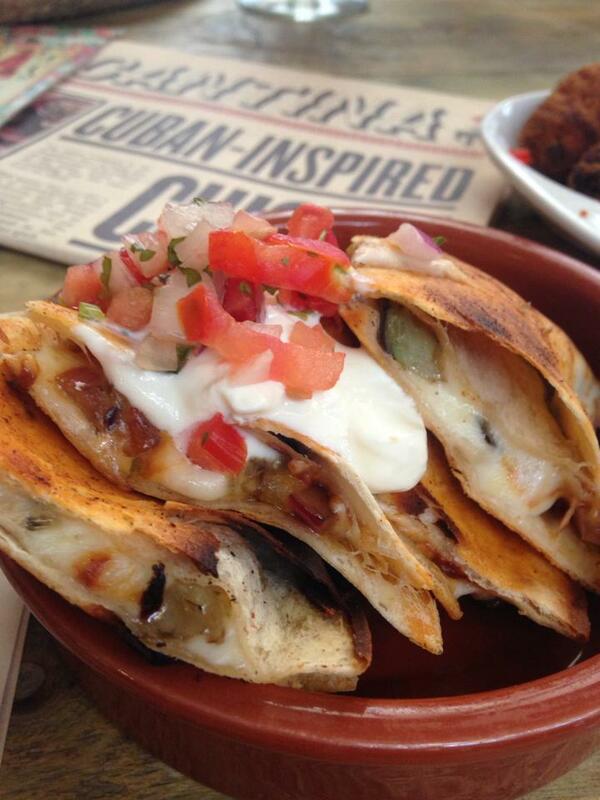 These fillings were so good, they deserve their own close up. 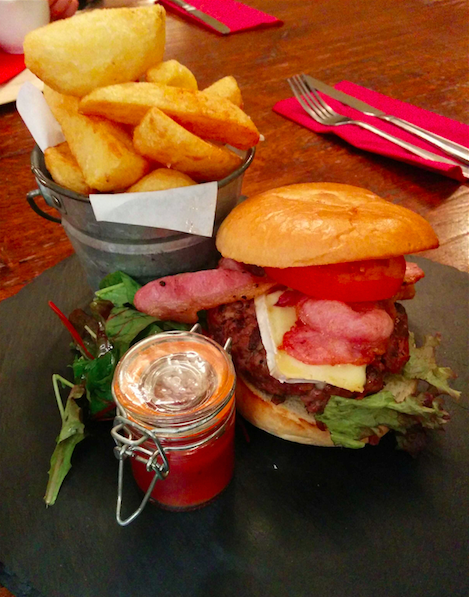 As already mentioned, all the Wick’s burgers come with chips and homemade relish. The chips are chunky enough to be wedges, crispy on the outside, fluffy on the inside, and served in a cute little bucket, while the relish is wonderfully rustic, with that strong tang of fresh tomato, and a spicy kick. 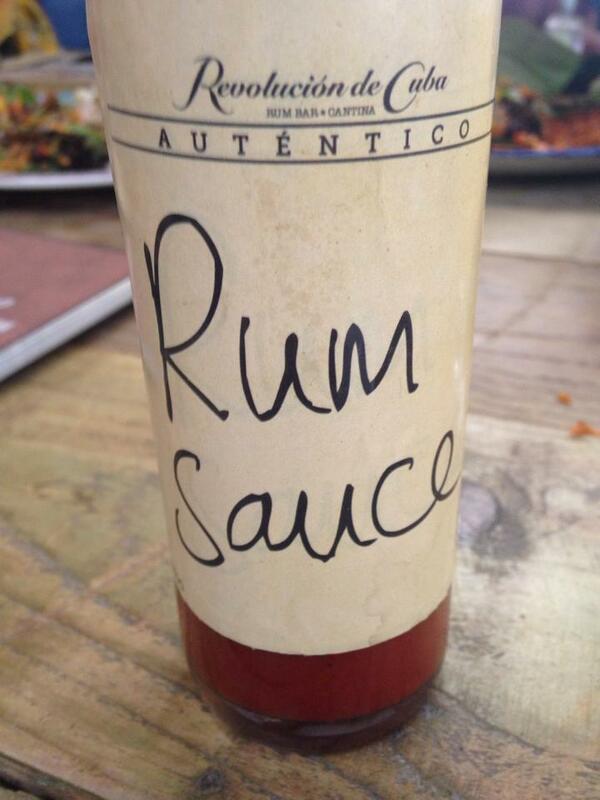 Exactly what you want when you’re tucking into a burger! My second burger-buddy opted for a Y-Fenni Mustard Ale cheese topping (yep, you guessed it, an extra 95p). This cheese had a fiery mustard flavour, although apparently they struggled to taste the ale, which was a bit disappointing. 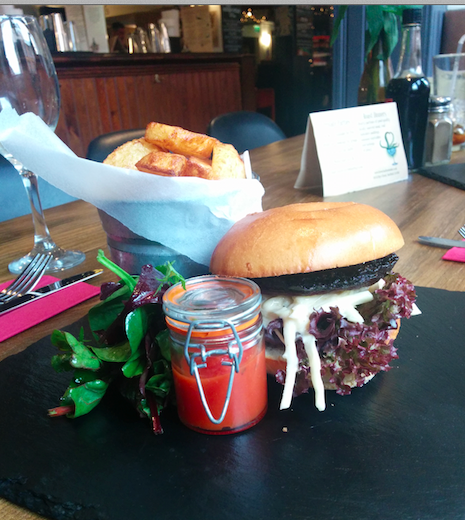 Finally, my mushroom burger arrived – and I can confirm that it’s still pretty much my favourite burger ever. Sometimes, when a restaurant offers a veggie burger, they simply swap the meat patty and fillings for a veggie-friendly patty, but the Wick is one of the few establishments that treats the much-maligned veggie burger as a meal in its own right, rather than just an “alternative” for those who don’t eat meat. The Wick’s veggie burger takes the form of a whole field mushroom smothered in crunchy celeriac and cabbage slaw. This is the sort of creamy, rustic slaw that’ll have you swearing off shop-bought condiments and Googling “homemade coleslaw recipe” – probably before you’ve even finished your burger! The Wick aren’t stingy with the slaw either, so keeping it inside the burger is bit of a challenge, but it’s well worth the trouble. Basically, I love everything about this burger. 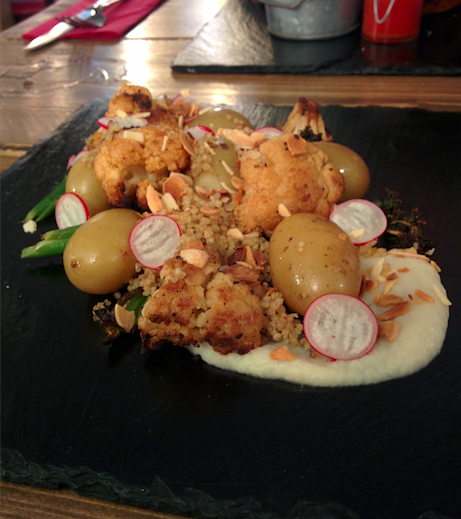 But, this Wick trip wasn’t just about pigging out on gourmet burgers and chips, as the final meal arriving at our table was a very intriguing-looking roast cauliflower and broccoli dish, served with a quinoa, radish, almond and new potato salad (£7.95). The cauliflower did have some burnt edges, but thanks to that deliciously nutty, slow-roasted flavour, this didn’t matter – apparently even the blackened bits were tasty! Who knew the humble cauliflower could taste so good? The quinoa was fluffy, the almonds were toasted and tasty, and the new potatoes brought some satisfying starch and carbs to the meal. These rather random-sounding foodstuffs turned out to be the perfect combination of textures and flavours. The whole thing was finished off with a dollop of cauliflower puree. Like the roasted cauliflower and broccoli, this vegetable puree is far nicer than it sounds, and is further proof that you can do wonderful things with even the most boring, everyday veggies. The only complaint was that the portion of puree was too small. More, please! If you fancy a change, this unusual salad is definitely worth a spin. I’d enjoyed my goat’s cheese and beetroot salad during my previous visit, but this looked far more substantial. I’ll definitely be trying this cauliflower, broccoli, and quinoa salad for myself in the future! The Wick at Both Ends never fails to impress. If you haven’t been yet, then to put it simply: you’re missing out on a great venue, great cocktails, and some truly first class food! When I’m umm-ing and arr-ing over a place to eat, the Wick at Both Ends on West Street always crops up sooner or later. It’s one of those places that always ticks all the right boxes: good atmosphere, lots of comfy booths, nice decor, a large cocktail menu, pleasant staff, and a food menu that has something for everyone. Basically, I love everything about the Wick; so when an invite to the launch of their new Spring/Summer menu arrived in my inbox, I was pretty excited. Wick fans will be happy to hear that the always-awesome Wick burgers are still present and accounted for on the new menu, and the starters look as interesting as ever, with pork cheek faggots, vegan cheddar, and red pepper sabayon all making an appearance. Since summer is just around the corner (hopefully), salad and fish features more heavily than on previous menus, but the Wick hasn’t completely done away with the comfort food, so on chilly days you can still warm up with mash, roast lamb, gravy, and belly pork. But, every good meal starts with a drink. 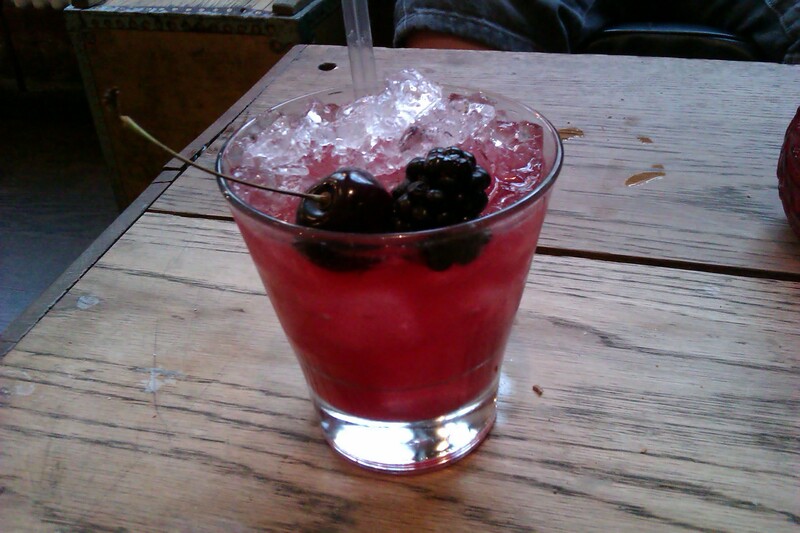 We kicked things off with a refreshing Double Grape Martini (£5.75), a summery blend of white wine, vodka and vanilla. 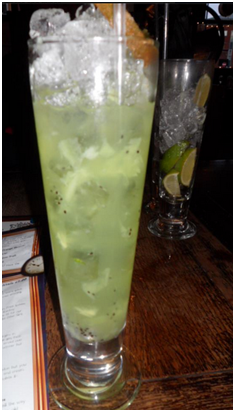 This is the ideal light drink to accompany a heavy meal, and it went down very easily. 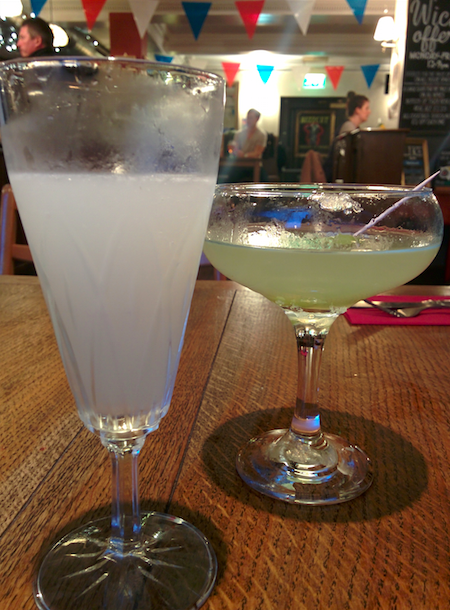 Also arriving at our table, was a Corpse Reviver #2 (£7.00). On the menu, this blend of Portabello Gin, Cointreau, Noilly Prat, and Absinthe is described as “guaranteed to bring you back to life.” The Wick aren’t kidding! This is a firecracker of a cocktail, in a deceptively dainty glass. When you’ve visited a place multiple times, you can fall into the routine of ordering the same thing time and time again (for me, it’s the Wick’s delicious mushroom burger), so I resolved to break out of my rut, and opted for a salad of glazed beetroot with goat’s cheese and pine nuts, in a balsamic vinaigrette (£7.25). 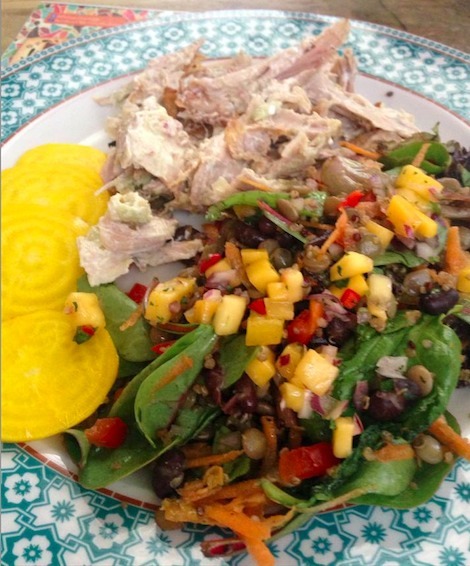 This is a “proper” salad, where dressed leaves make up the majority of the dish. I love goat’s cheese, and the Wick’s is some of the best I’ve ever tasted. 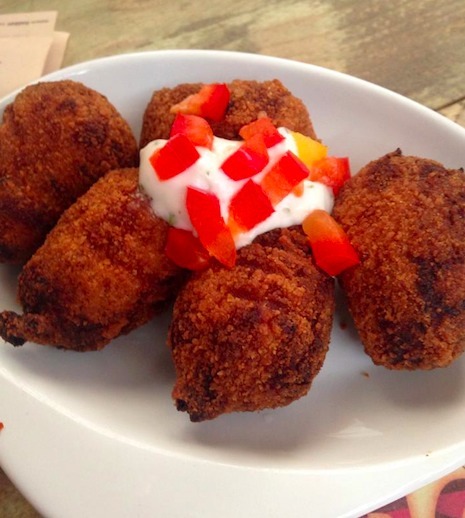 This goat’s cheese is like bombs of pure, melt-in-the-mouth indulgence, wrapped in a lightly-toasted exterior. Biting through the rubbery, toasted cheese, into its oozing center, is something everyone should experience at least once in their lifetime. Amazing. The rest of this dish is a salad of mixed leaves, doused in a vinaigrette that gives the salad a tangy edge, and finished off with chunks of beetroot and a teeny sprinkle of toasted pine nuts. The whole thing sits on a bed of beetroot that’s so thinly-sliced, it has a semi-transparent pattern of alternating pink and white bands. The beetroot also has a woody taste and texture, which was unexpected. I love it when places take an everyday vegetable and make it taste like something new. 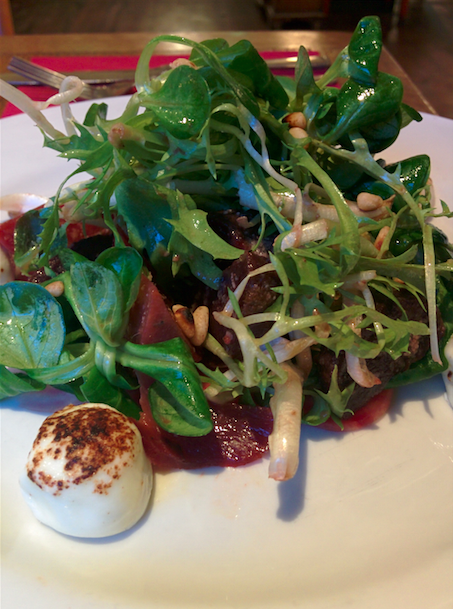 The goat’s cheese and beetroot salad is a very light dish, with some quirky touches, although I’d have preferred larger portions of the cheese and pine nuts, as these are the ingredients that stand the best chance of filling you up. 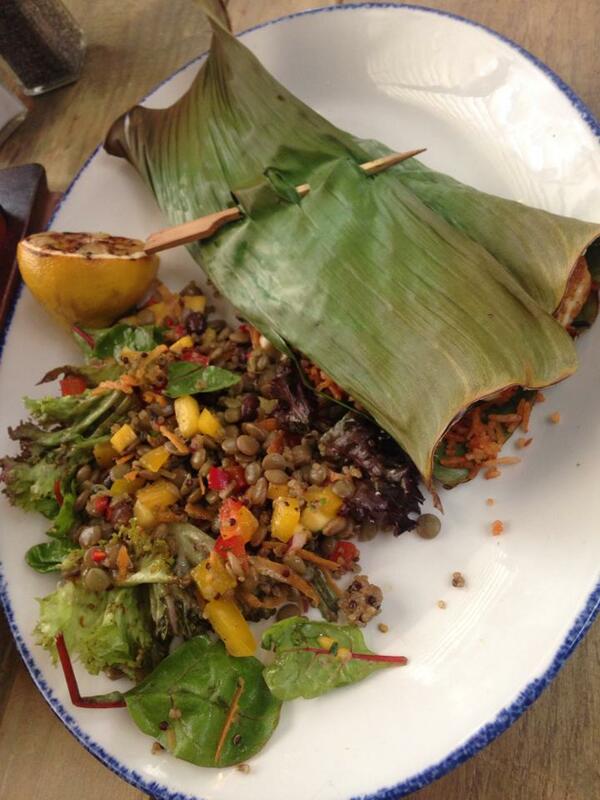 Overall though, this is a great, summery salad – just don’t order it if you’re ravenous! 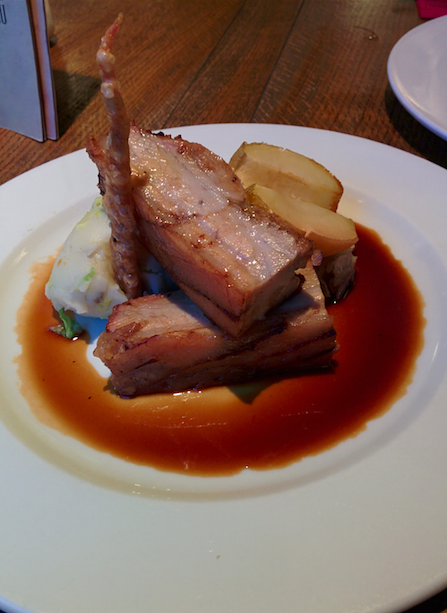 At the other end of the table, it was like winter all over again, with a plate full of roast belly pork and bubble and squeak, served with roasted apple, chutney and cider sauce (£8.50). The Wick clearly set out to wow with this dish. Mission accomplished – it looks fantastic! The generous portion of meat was tender and juicy, and the cider sauce was a welcome change from the usual gravy or jus. The promised bubble and squeak turned out to be a portion of mashed potatoes with some boiled cabbage mixed in, rather than the mash and fried veggies I’d always understood bubble and squeak to be. Despite this, the Wick’s take on bubble and squeak was still pure comfort food. The real star of this dish, is the roasted apple. Whenever I’ve roasted apples, it’s always gone wrong, with hard, uncooked centers or mushy exteriors. Clearly, I need to take lessons from the Wick, because this apple was cooked to perfection and had a lovely flavour. If you’re in the mood for classy comfort food, it doesn’t get any better than the Wick’s pork, cider sauce, mash and roasted apple. The words “best meal I’ve ever had” were even uttered! Due to my light main course, I was still peckish, and so couldn’t resist checking out the dessert menu. I don’t have much of a sweet tooth, so when I spotted the cheese board, I knew this was the “pudding” for me. The Wick at Both Ends puts a nice spin on their cheese board, by letting you construct your own board from a selection of cheeses (a trio of cheeses will cost you £5.95). I opted for the Y-Fenni Mustard & Ale, Godminster Brie, and the How’s ‘yer Father Lancashire. 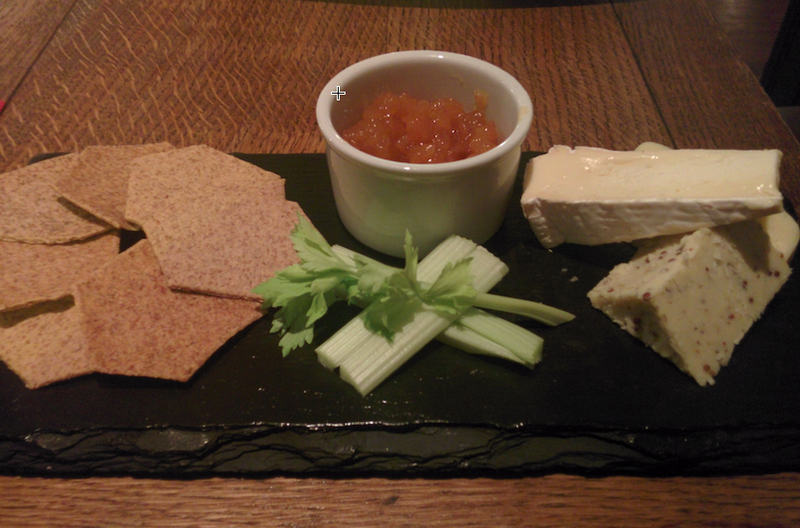 My cheese board was served with that funky, rustic flair that the Wick do so well, arriving on a heavy slate, alongside a bowl of chutney, celery sticks, and a hexagonal arrangement of oatmeal crackers. The chutney was particularly good. It was homemade, and struck that perfect balance between fruity sweetness, and sour notes. Cheese, chutney, crackers and celery is always a winning combination, and it’s clear that the Wick use top quality ingredients. We also ordered a sweet pudding, in the form of a caramel cheesecake, which came with homemade pear sorbet and caramel sauce (£4.75). The cheesecake was indulgent, and had the kind of creaminess that makes you savour every bite. 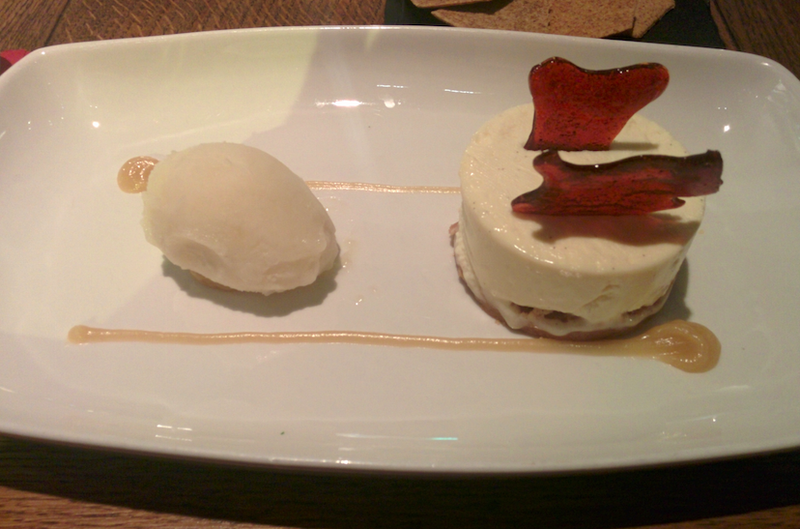 This rich cheesecake was perfectly complemented by the fresh, icy sorbet. It’s difficult to pick fault with the Wick at Both Ends. While the portion of cheese and pine nuts on my salad was on the small side, and I wouldn’t have said no to bigger wedges of cheese on my cheeseboard, the quality of the ingredients, and the obvious care that’s put into preparing each dish, means that the portions are reasonable for what you pay. I’ve eaten at the Wick a couple of times, through multiple menu changes, and have tucked into everything from tapas, to Sunday roasts, pies, and burgers – and I’ve never once had a bad meal. The Wick really do serve some of the best grub in Sheffield, and I can’t wait to return and sample more of their new menu. For those not already in the know, The Wick at Both Ends is a quirky West Street venue kitted out with mismatched armchairs and some of the comfiest corner booths you’re likely to find in a pub. The bar is decked out with fairy lights the whole year round, there’s plenty of arty graffiti on the walls, and table decorations fashioned out of peacock feathers, flowers and old liquor bottles. There’s also a stash of oldschool board games, if you fancy whiling away an afternoon playing Bizzy Bizzy Bumble Bees or Connect Four. This cosy West Street venue clearly has bags of character, but are the food and drink up to scratch? 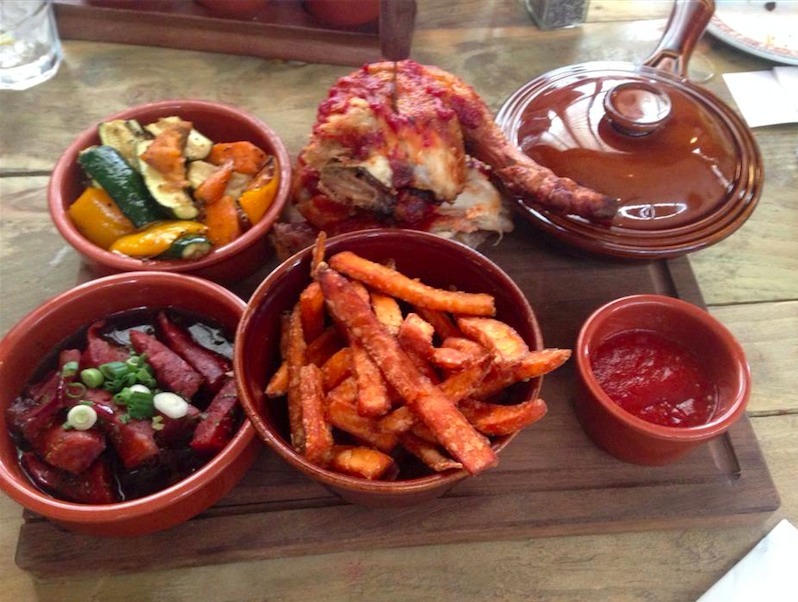 The Wick’s menu is a three-headed beast of main courses, tapas and Sunday roasts. 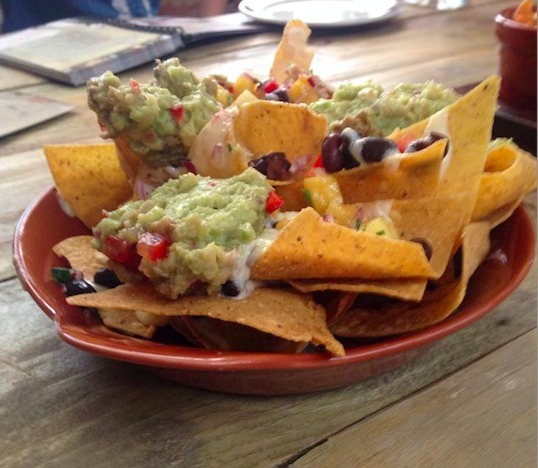 The main meals and tapas in particular offer a quirky take on standard pub fare; tapas-lovers can enjoy a Carpaccio of Smoked Venison, soup served in teacups or Bloody Mary Stuffed Mushrooms, while the main courses include a fresh take on that old classic Ham, Egg and Chips. However, we visited on a Sunday, so it only seemed fitting to give their roasts a whirl. At £7.95 for the meat option and £6.95 for the vegetarian alternative, the Wick are pitching at the upper end of what you’d be willing to pay for Sunday lunch, but with a menu that boasts “real” Yorkshire puddings, lashings of gravy and locally sourced meat, it promises to deliver. 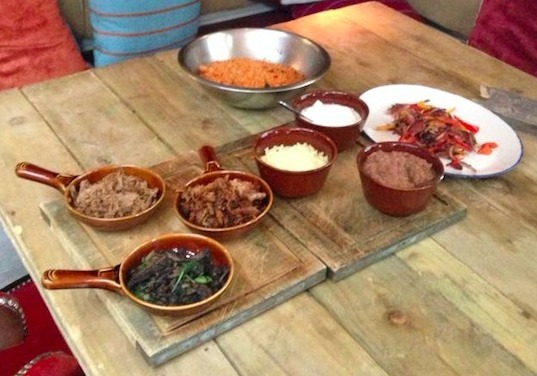 Carnivores get a choice of meats, whereas veggies have just one option for their Sunday roast. This is pretty standard, but is worth bearing in mind if your party includes a fussy non-meat eater. This refreshing cocktail puts a fresh slant on the Moscow mule by adding homemade lime liqueur and freshly-squeezed kiwi juice. A Dark and Stormy (£5.00) was also on the cards, which was topped off with plenty of fiery ginger beer. 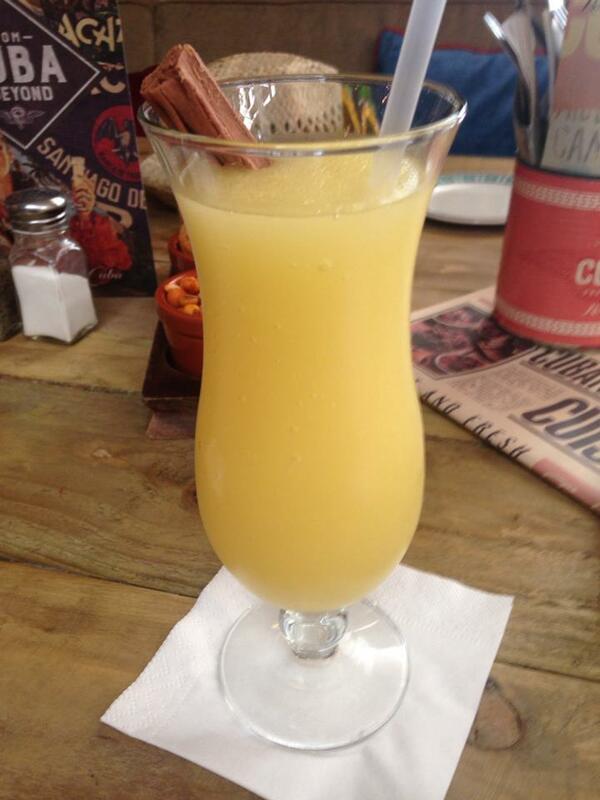 Just what the doctor ordered on a gloomy Sunday afternoon! The Wick at Both Ends has an enviable cocktail menu, and many of the cocktails utilize a long list of fresh fruits and herbs. If you’re a cocktail fan, you’ll be happy to spend whole afternoons and evenings working your way through the Wick’s menu. 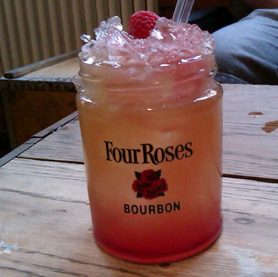 However, it is worth noting that many of the cocktails – especially the fruity ones – aren’t particularly strong. If you’re used to getting headspin from a single cocktail, then you’re better off sticking to the less extravagant options, such as the Dark and Stormy. 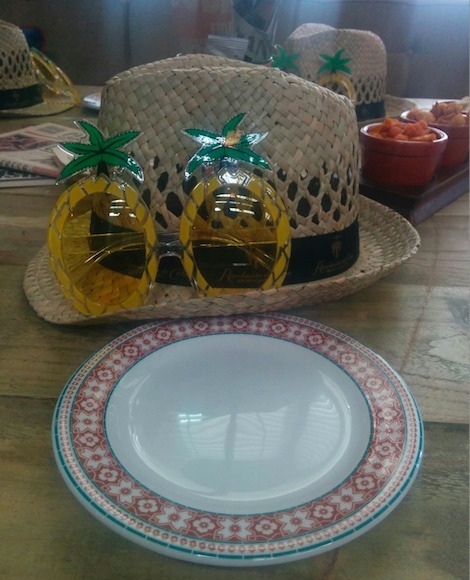 Halfway through our cocktails, the Sunday dinners arrived at the table. Initial impressions were mixed, for the price we’d been hoping for a belly-busting mountain of food. Both meals came with carrots and spinach, a couple of roasties, a homemade Yorkshire pud and gravy, but we agreed that the plate was missing another Yorkshire pudding, or even a few more roasties. Still, you can’t knock the Wick’s Sunday dinner for taste: the carrots in particular were delicious, tasting as though they’d been cooked in butter (you need a little fat in your Sunday lunch when it’s cold outside!) then rubbed with cracked black pepper and sea salt. Possibly the most unhealthy veggies in the world, but they were gobbled up in no time. Now, it’s clear from the photo that the Yorkshire pudding didn’t look particularly appetizing. I was expecting a puffed-up, lumpy homemade Yorkie, but what I got was a deflated curl of batter with a suspiciously dark crust. But, never judge a Yorkshire pud by its sad, deflated cover, because the Wick’s Yorkies are delicious. A little on the burnt side, and not the prettiest of puddings, but when soaked in a little gravy the batter melted in the mouth and had that satisfying, homemade taste. But onto the real star of my Sunday dinner – the veggie wellington. I’m not a massive pastry fan, but the Wick’s pastry was light and crispy, and soaked up oodles of flavour from the gravy. The filling was a stodgy, gut-busting blend of cheese, spinach and mushrooms. 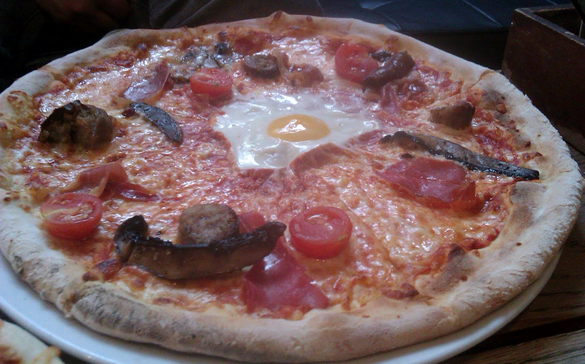 It looked a little grey and unappetizing, but the filling was actually chock full of flavour and settled in my stomach, a warm wodge of calorie-laden comfort food. I usually avoid pastry dishes, but I scraped up every last bit of gravy-sodden veggie wellington. 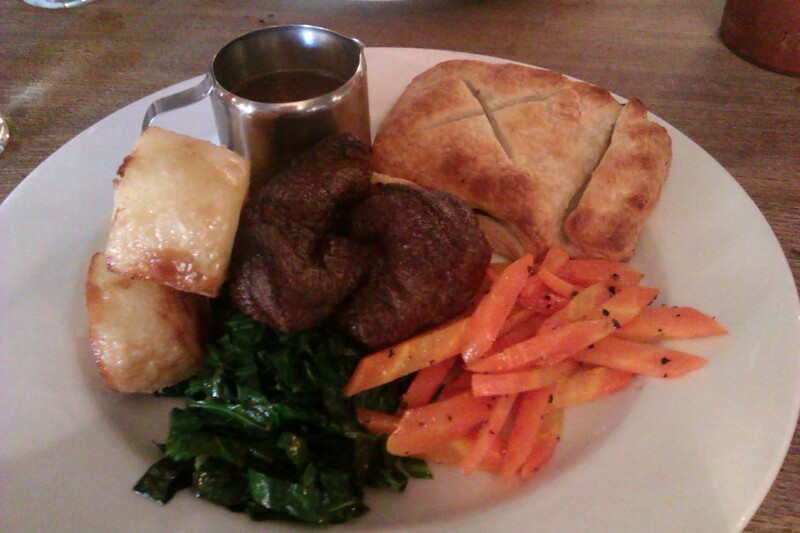 Even if you’re a carnivore, I can heartily recommend the Wick’s vegetarian wellington. If you’re craving some animal protein you’re in for a treat too, as the meat-eaters’ Sunday roast comes with the same buttery carrots, spinach, crispy roasties and homemade Yorkshire pudding plus, of course, hearty slices of meat (in this instance beef.) 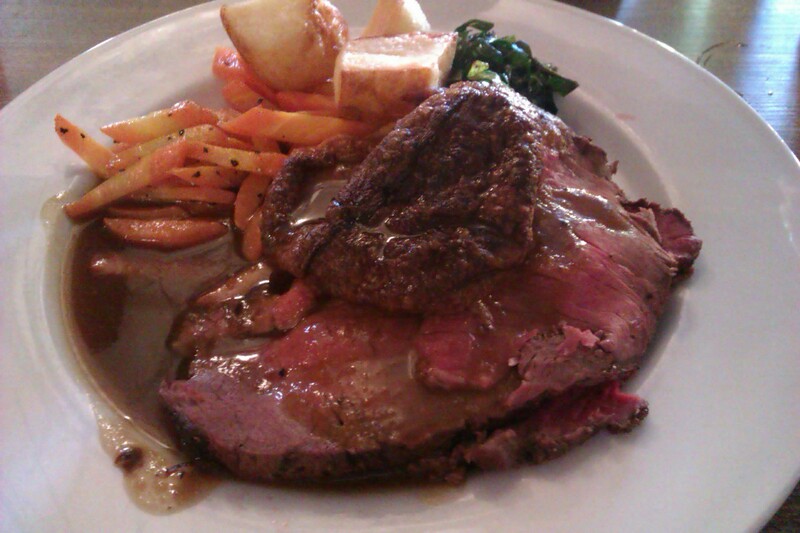 The roast beef had been cut in thick, generous slabs, and arrived at the table tender and tasty. Although a little pinker than some diners would like, there were no complaints from our table. 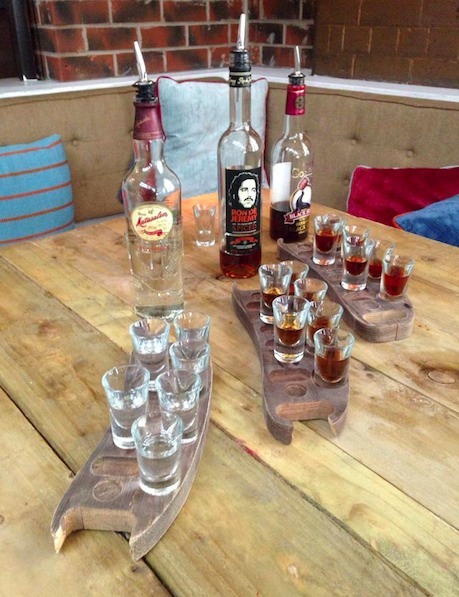 The Wick is a fun, distinctive venue with friendly staff and plenty of atmosphere. 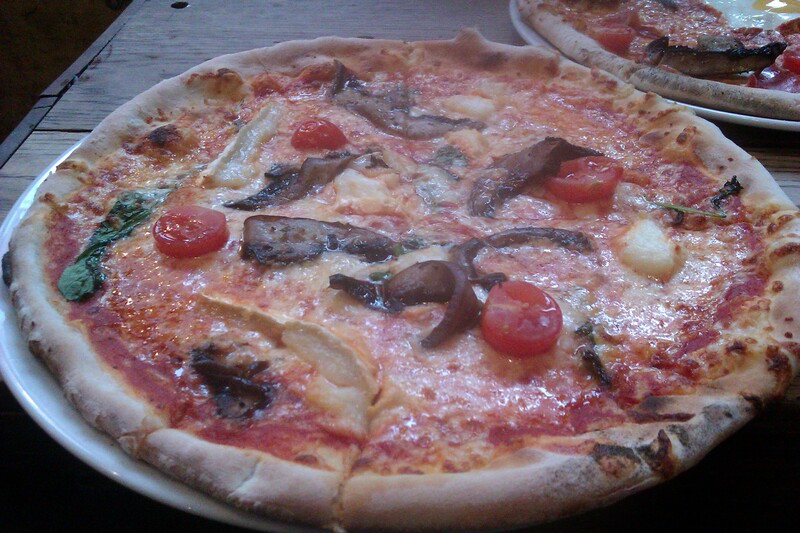 There’s always a few people in the cosy corner booths even on weekday afternoons, and it’s easy to see why. 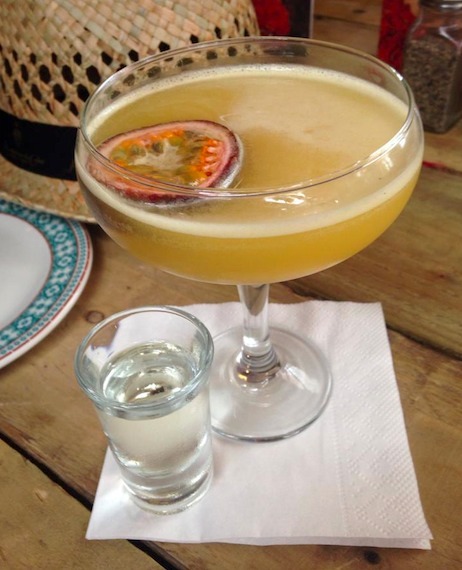 The cocktail menu is one of the most diverse in the city and, with three different menus to choose from, it’s not just on the cocktail-front where you’re spoilt for choice. The Sunday roasts are a little pricey, but that’s understandable when you take into account the clear quality of the grub. Hearty, tasty, and satisfying comfort food – perfect for the long winter months. A Sunday roast where even the carrots and spinach are delicious, who’d have thought it possible? One thing that was sorely missing from the Sheffield food and drink scene until recently, was a proper gourmet coffee shop. So, we were delighted when we heard about Tamper Coffee, a new cafe specializing in coffee and cakes, and since our first visit we’ve been completely hooked on its charms. 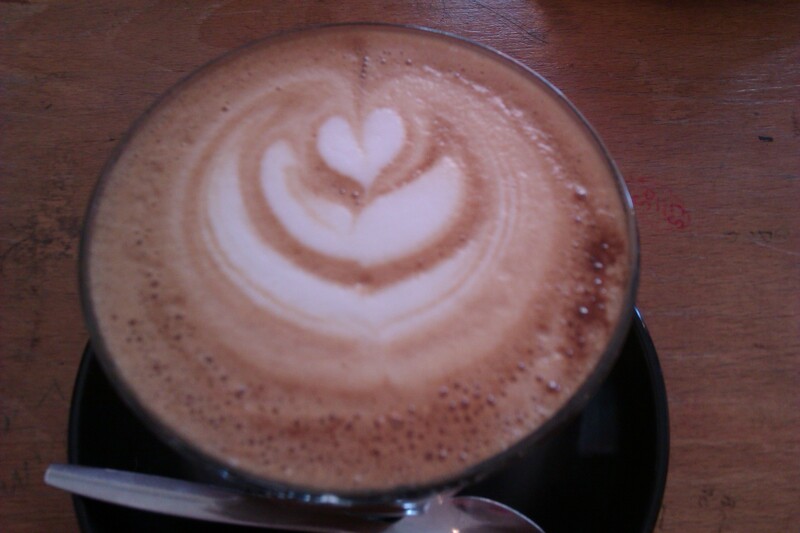 Tamper Coffee is somewhat tucked away on Westfield Terrace, but it’s well worth hunting out. Be prepared for a warm welcome when you step inside Tamper Coffee. This is the sort of place where the staff recognize you after the first few visits – a rare phenomenon in this age of coffee shop corporations. Our party kicked off a very sophisticated afternoon with coffees all around. Lovingly brewing coffee from scratch takes time but with table service on offer this is no big deal – and the coffee is worth the wait. The lattes (£2.20) were served in cute glass cups on black saucers (a very funky combination I’m now going to use when I’m trying to impress house guests!) To top it off, Tamper Coffee sketch a little picture in the frothed milk of every latte. You don’t get service like that in Starbucks! Just as we’d finished coo-ing over our drawings (the team member who ended up with the bunny rabbit was particularly impressed) our Tamper Coffee cappuccinos (£2.20) arrived, topped with a generous sprinkling of chocolate powder. On their website, Tamper Coffee boast the tagline “serving only the best and freshest coffee in Sheffield.” A bold claim, but one that’s difficult to dispute. Made with Our Cow Molly milk and locally-roasted beans, it bears absolutely no resemblance to the brown stuff you find at the big-buck coffee chains. Coffee lovers, Tamper is your dream come true. Quite simply, it’s the best coffee I’ve ever tasted. Not content with serving the best cuppa in town, Tamper Coffee’s menu stretches to a selection of sarnies, cakes and breakfast items. Our table ordered two smoked salmon, cream cheese and rocket bagels (£3.80 each) which were served on rustic wooden boards. Starving, my face fell at the size of the meal, but it was all an optical illusion: the smooth cheese, tangy smoked salmon and deceptively filling bagel left me stuffed. Although I turned down dessert, not everyone could resist and a couple of date scones (£1.80 each) found their way to our table. 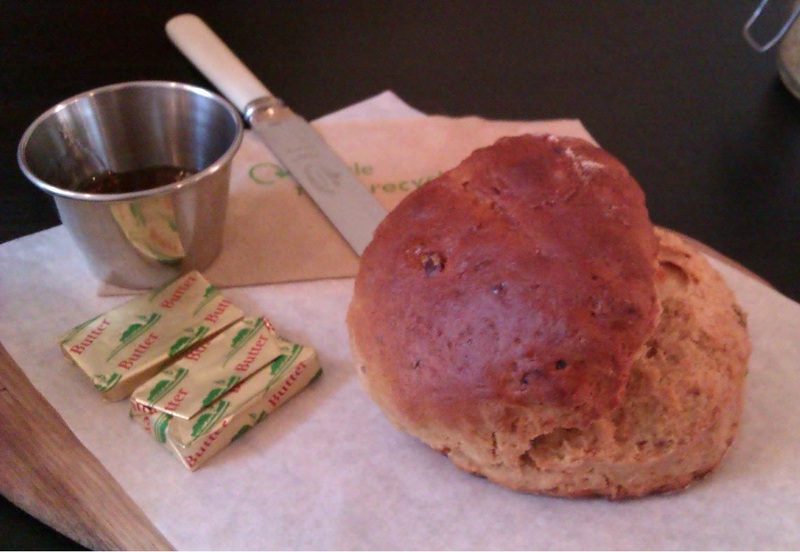 Tamper Coffee’s date scone is a lumpy, homemade-looking sweet treat that tastes every bit as fresh as it looks. It came with tasty raspberry jam and butter, although it’s laced with so many plump dates it can be enjoyed on its own. So, the best cuppa in town, fantastic food, homemade cakes, reasonable prices and friendly staff – but being the best in the business comes at a cost: Tamper Coffee was absolutely rammed when we visited over the weekend. Although they have just opened an extension with a few extra tables, we struggled to find enough seats for our party, and the waiting time for food was the longest I’ve ever experienced in a cafe. In fact, one of our meals (a ham and cheese croissant priced at £3.00) got lost in the rush of orders, and by the time it was remembered we had to leave. Tamper Coffee is a real gem of a coffee shop that deserves to do well, and it’s always exciting to see a homely, independent place thriving, but on that particular day I couldn’t help wishing it wasn’t quite so busy. 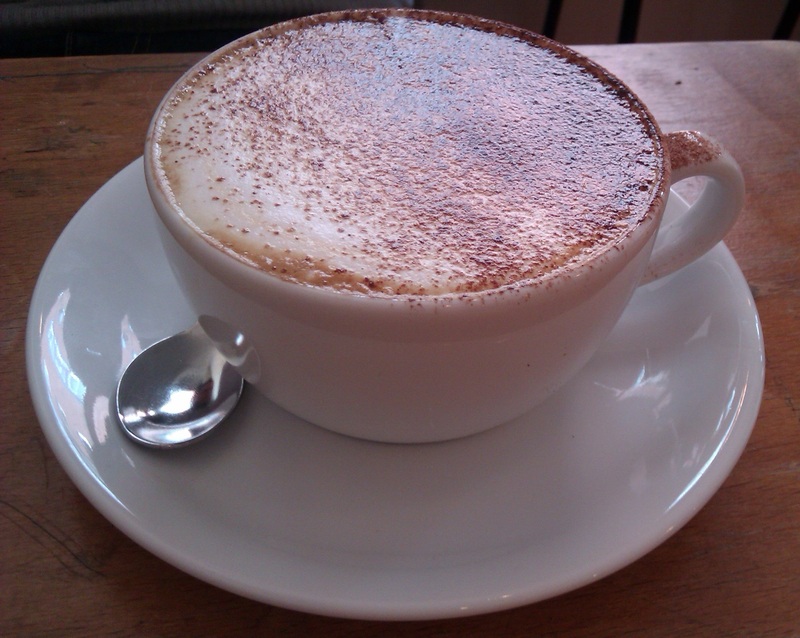 If you like fresh coffee and yummy cakes in a vibrant, local and friendly venue (and really, who doesn’t?) then what are you waiting for?